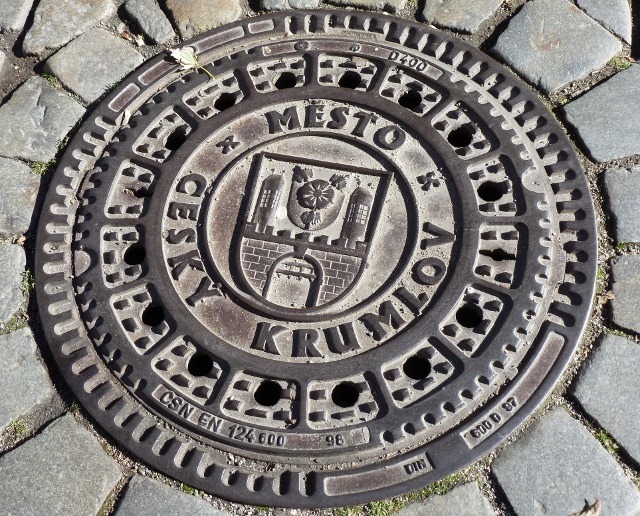 I first visited Český Krumlov on a chilly spring weekend in the early 90s with a friend who was teaching in Prague at the time. We fell for its fairytale atmosphere, zany painted tower, the uneven windy cobbled lanes, crumbly aura, cosy bars and the Vltava river in spate. It wasn’t so long after the Velvet Revolution and it was still very much a locals’ town. We sat in a bar and got talking to a bunch of soldiers taking a break from their national service. There were just a handful of restaurants and bed and breakfasts, the odd hotel, a few shops and stalls I suppose too. The real gem was the ‘sausage place’, where you walked off the street into a small white washed cavern-like room with wooden benches and a fire in one corner, over which a very tall narrow white blonde woman tended the grill, and you drank wine out of pottery cups. 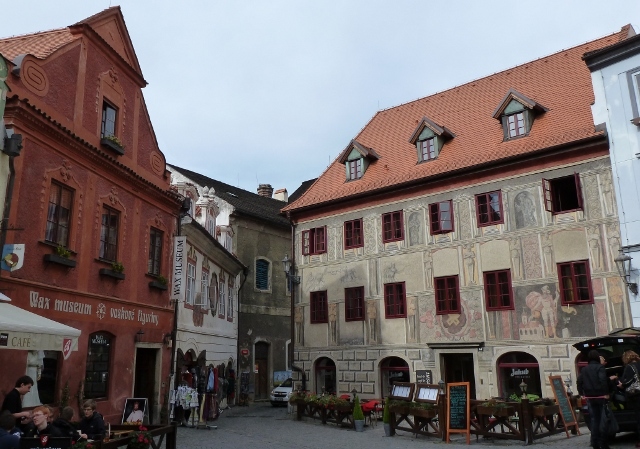 Of such things are memories made, and as much as I wanted to go back to Český Krumlov and to show Adrian one of my most favourite towns in Europe, I was very torn. We’d met people, who had been recently, who told us it was totally spoiled, very touristy. High season then though…maybe. Our route westwards was taking us across Southern Bohemia towards the German border, so we had to go there even at the risk of my memories crumbling. I’d been pleasantly surprised with the return visit to České Budějovice, which being quite a sizeable town carries its tourism well. So we took the plunge, and on a perfect clear sunny autumn Sunday. We drove the 25km south to Český Krumlov. On the edge of town there were always a few brightly coloured paneláky (Communist era apartment blocks), but now they were joined by German and British out-of-town supermarket giants. We descended the hill and caught our first glimpse of the tower and castle basking in sunlight… they were more dramatic than I’d remembered and brought a tear to my eye. 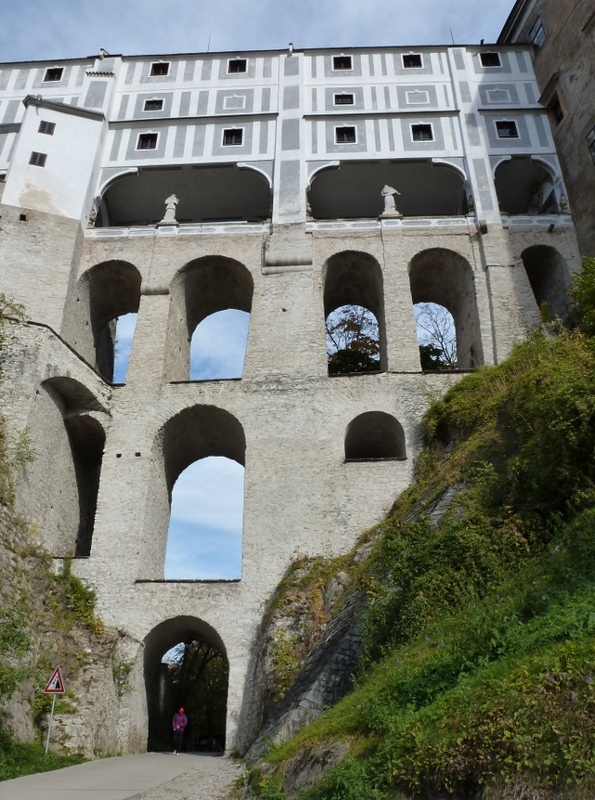 We parked up on the edge of the old town outside the castle walls (expensive parking in relation to other pricing), and walked under a spectacular galleried bridge structure, which I didn’t remember. There was work in progress on part of the river, improving the bank defences – there were bad floods back in 2002. We crossed over to the town, although early it was already busy, and explored its streets. Every frontage is now primarily a tourism-related business, whether a shop, a restaurant or a pension. Fair play, you have a town that is beautiful and sought after by visitors, and you want to make the most of the opportunities this presents. 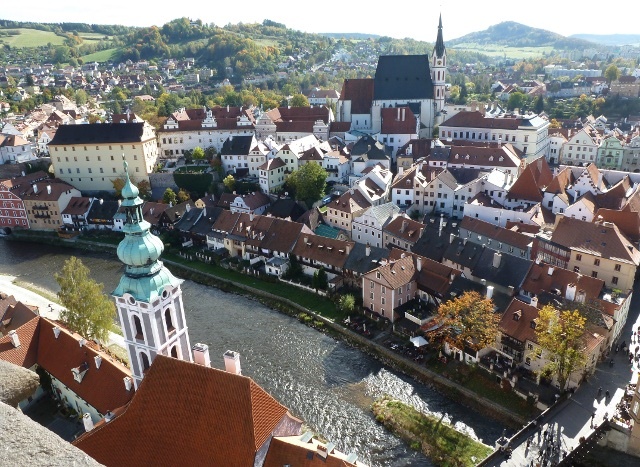 Perhaps there are tourists who would visit the wax works, the mirror labyrinth, the torture museum and the umpteen gift shops, but Český Krumlov has an ‘oh wow’ view round every corner, as well as its churches and castle, isn’t this more than enough? 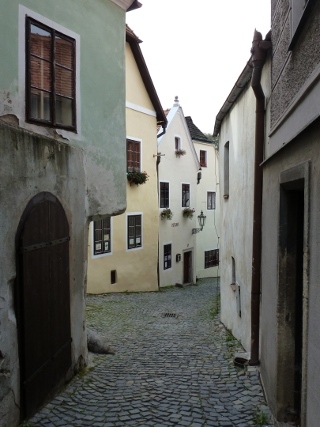 Walk along the few off-the-main-drag streets and you start to feel the old ambiance. As the morning went by, we walked down and up every tiny street, looking at everything, trying to find places I remembered. Much of it has been restored, mostly sympathetically, which is great because there are some lovely painted buildings and there are still some that need attention. There is always a thin line between saving old buildings, and destroying their character with perfectly even render and pristine paint jobs. Eventually we came to the main square which was lovelier than I remembered, and just off it, up a narrow side lane I found what I knew to be the ‘sausage place’. I had thought I’d found it on the internet and expected it to have moved or expanded if that were possible. There was a curtain across the door so I thought it was closed. I glimpsed through and saw the flames from the grill – on a different side of the room from what I remembered. Just then, a Japanese lady pulled the curtain aside and ushered her tour group inside to ready set tables for lunch. It was only just after eleven o’clock. We passed by again later, and saw a throng of people, as a massive group descended. It must have been substantially expanded inside then, but we didn’t see further than the doorway. No longer a ‘quaint’ locals’ eatery that could have retained its charm, it is now a stop on the tour circuit. No locals and no independent travellers would find a place inside. We had thought of spending the whole day and evening in the vicinity, but in general, although there are quite a few attractive looking restaurants, everything felt very touristy. We chose our lunch place carefully, but the first place, in attractively restored surroundings didn’t seem interested in serving us, even after we’d got our own menus and chosen. We walked out of there to our second choice, the Travellers’ Restaurant, part of a hostel complex, with the tables in not overly restored stables. Much more to our liking, with delicious food…and beer, of course, at very reasonable prices and with better service. When we had come into our parking spot earlier in the day, we’d noticed a rather unsettling noise from the engine. Loath to take a more in depth look as this involves taking the bikes off, and the things we store behind the seats/on the bed out, we’d decided to see the town first. During the day though it preyed on our minds, well more Adrian’s really as he ran through all the things that might be causing the untoward sounds. Instead of heading for a nearby campsite, we decided to return to České Budějovice as that would be a better base should we need to source parts. We both wanted to have a closer look at the tower and castle first though, and made our way up. 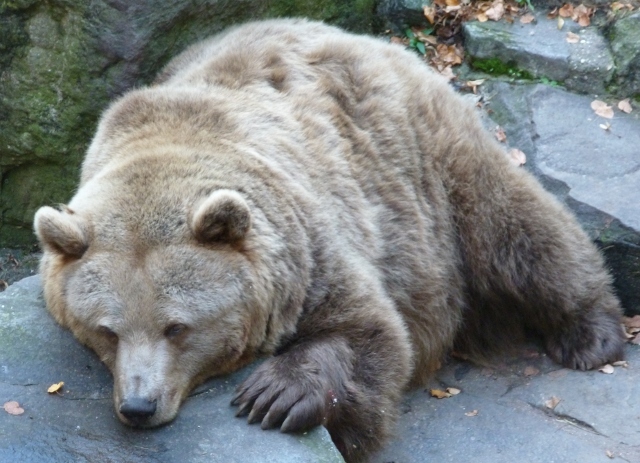 You cross a bridge below which a couple of bored looking bears live. Real big brown teddy bears several metres below, with lots of tourists climbing on the wall to have a closer look in spite of signs warning against this. There was a museum and the tower first off, and we opted to climb the tower. There were wooden and stone staircases and wonderful views from the top across the town. There were only a few people, but as we left, we managed to dodge a huge incoming tour group of youngsters on their way up. I can only imagine how they would have fitted up there and how much they would have clogged up the stairway. What a lucky escape. There was a separate entrance fee for the interior of the castle itself and although appealing, it was quite pricey at over £10 a head. We walked from painted courtyard to painted courtyard through gateways and passageways, expecting any moment to be stopped for our non-existent ticket. 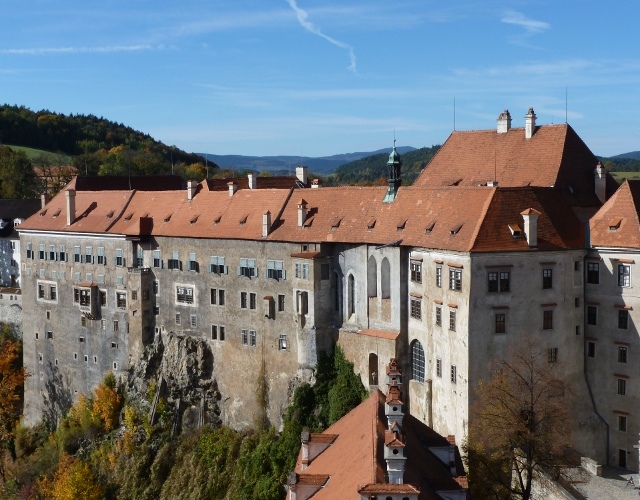 We managed to walk right the way through the exterior areas and over the galleried bridge without having to pay, and that was all we really wanted to do anyway. More incredible views were taken in while dodging walls of Japanese tourists taking pictures of each other in every conceivable corner. 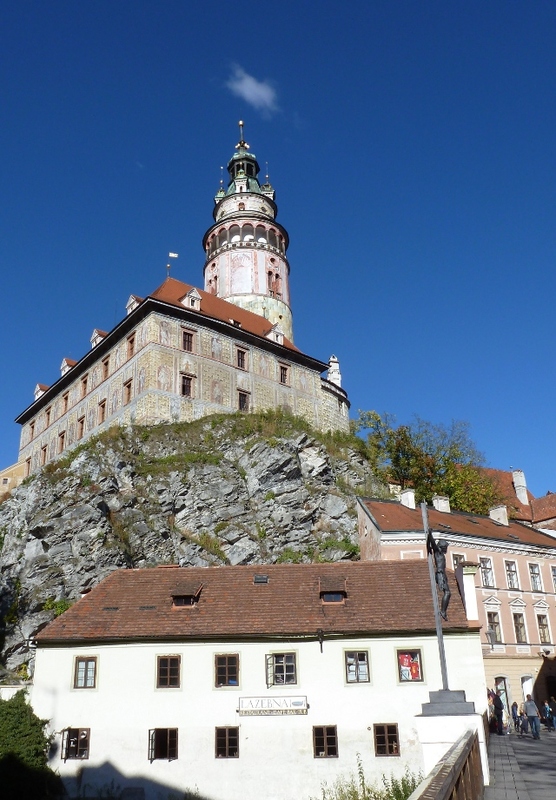 I’m pleased to say though, that in spite of the mass tourism, Adrian also fell in love with Český Krumlov. As he put it ‘the town rises above’ the tourism that’s become a part of it. It is always a risk to go back to places you’ve loved, and I’ve satisfied my curiosity on this one, but there is a tinge of disappointment too. 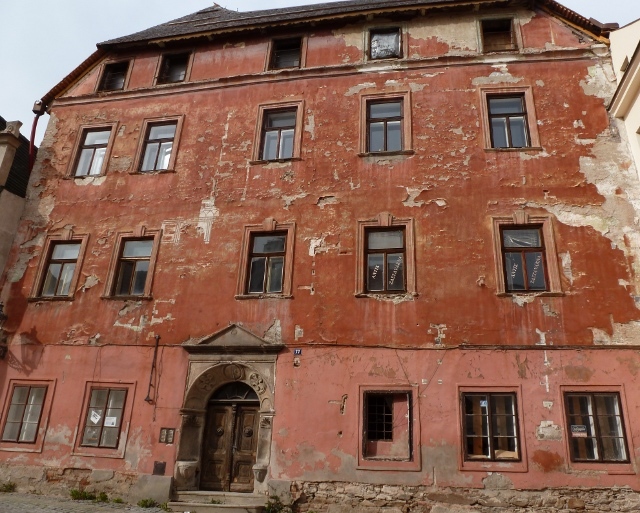 A gradual meandering back down through the town was followed by a steady drive back to the campsite at České Budějovice with the van still sounding rough. Adrian was in overalls straightaway on our return, and one of his surmises proved correct. The waterpump bearing wasn’t doing its job, so the pulley where one of the belts sits was moving all over the place. This called for a replacement waterpump. Not just any waterpump, it needed to be specific to our petrol model of T25. We now have a deadline to get to Hoek van Holland for our ferry in a week’s time… will we find the part? Will we make it? How will we make it? This entry was posted in Art & Culture stuff, By Country - Czech Republic, Travel stuff, Van stuff. Bookmark the permalink.